"Tribute to an Incredible Servant of God "
BILLY GRAHAM: AN EXTRAORDINARY JOURNEY is a terrific TV special honoring Christian evangelist Billy Graham who passed away February 21, 2018 at the age of 99. The TV program aired on Fox News following the Reverend Graham’s passing and tells how the world-renowned preacher impacted millions of people. BILLY GRAHAM: AN EXTRAORDINARY JOURNEY is a terrific TV special honoring the evangelist Billy Graham who passed away February 21, 2018 at the age of 99. The TV program aired on Fox News following Rev. Graham’s passing and tells how the world-renowned preacher impacted millions. A DVD of the program becomes available on Nov. 6, 2018. As the documentary recounts in interviews with Billy Graham, as well as interviews with his family members, the young Billy Graham grew up on a farm in North Carolina and had no interest in God or Christianity. However, as a teenager, he attended a revival meeting led by the evangelist Mordecai Ham, and Graham grew convicted of his sin and gave his life to the Lord. After that, he decided to attend Bible school, but he still struggled with his identity, often chasing after the affections of women. One day, after a girlfriend had broken up with him, Graham was particularly stuck in his life and fully gave himself to God, asking God to use him. It’s then that he fully heard and responded to God’s call to become a minister. Graham became a traveling minister and eventually met his future wife, Ruth, with whom he’d have five children, who would also carry on his legacy. The documentary recounts several times where the Reverend Graham faced opposition and was asked to compromise. For example, at one point many people opposed Graham’s position that the Bible is truly authoritative, but Graham stood firmly behind the Word of God. The evangelist also faced opposition during the Civil Rights movement when he refused to host crusades that segregating black people from white people. A friend with leaders like the Rev. Martin Luther King, Jr., Graham preached against racism and urged racial equality and unity among all races. BILLY GRAHAM: AN EXTRAORDINARY JOURNEY is a riveting, emotionally touching tribute to a man who boldly proclaimed the Gospel of Jesus Christ across the world, leading hundreds of thousands of people to Christ. The impact the Rev. Graham had on people crossed racial, political and national lines. This impact is particularly evident when the documentary shares testimonies from former Presidents like George W. Bush and Bill Clinton to TV hosts like Larry King and Diane Sawyer. The special shows how Graham had a special ability to calm and comfort people in the midst of trials and tribulations that can only be explained by the Holy Spirit’s anointing. Tremendously edited and structured, AN EXTRAORDINARY JOURNEY even has some tension as it chronicles the dangerous and tumultuous nations Graham preached in during his life. Best of all, in true Billy Graham fashion, it ends with an invitation to receive Jesus Christ. BILLY GRAHAM: AN EXTRAORDINARY JOURNEY is a must see for all people. BILLY GRAHAM: AN EXTRAORDINARY JOURNEY is a great TV special honoring the evangelist Billy Graham who passed away February 21, 2018 at the age of 99. The special program tells how Graham wasn’t interested in Christianity as a young boy, but gave his life to the Lord at 16 and eventually followed God’s call to ministry. The documentary recounts several times where the Reverend Graham faced opposition and was asked to compromise. For example, at one point many people opposed Graham’s position that the Bible is truly authoritative, but Graham stood firmly behind the Word of God. BILLY GRAHAM: AN EXTRAORDINARY JOURNEY is a riveting, emotionally touching tribute to a man who boldly proclaimed the Gospel of Jesus Christ across the world, leading hundreds of thousands of people to Christ. The impact he had on people crossed racial, political and national lines, and is evident when the documentary shares testimonies from former Presidents like George W. Bush and Bill Clinton to TV hosts like Larry King and Diane Sawyer. 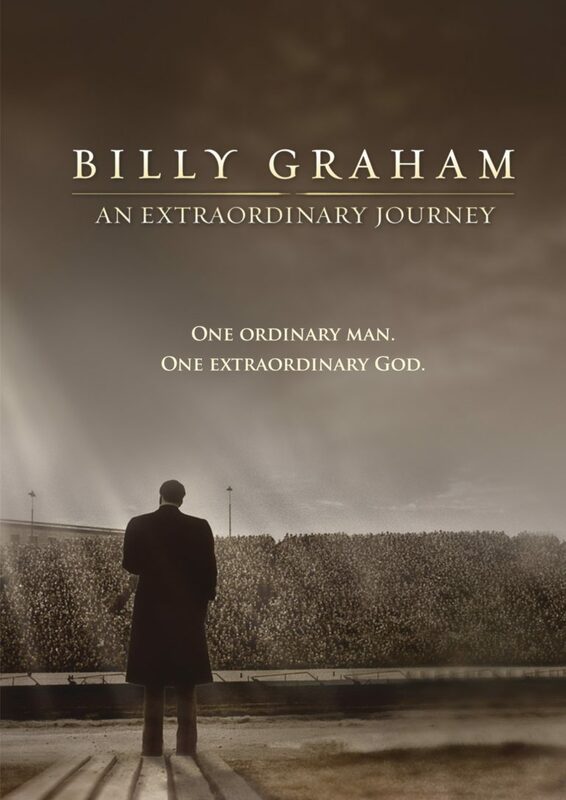 On DVD November 6, BILLY GRAHAM: AN EXTRAORDINARY JOURNEY is a must see.